I took quite a bit of time allowing Codex to fully sink into my psyche before I even began to consider reviewing it. Some albums require but a matter of moments to understand the beauty of their content. Other works might take years to fully unveil their secrets to the listener. Atrium Carceri has always been one of the latter for me. It is impossible to fully appreciate these works by just putting them on as background music. I find that I must enjoy Atrium Carceri much like I do with works of David Lynch, repeatedly and under various mental states. The first set of listens revealed an album which was much more musical than I was expecting. Atrium Carceri has for a long time incorporated tracks which show much more resemblance to fully structured songs than most other artists in the genre. 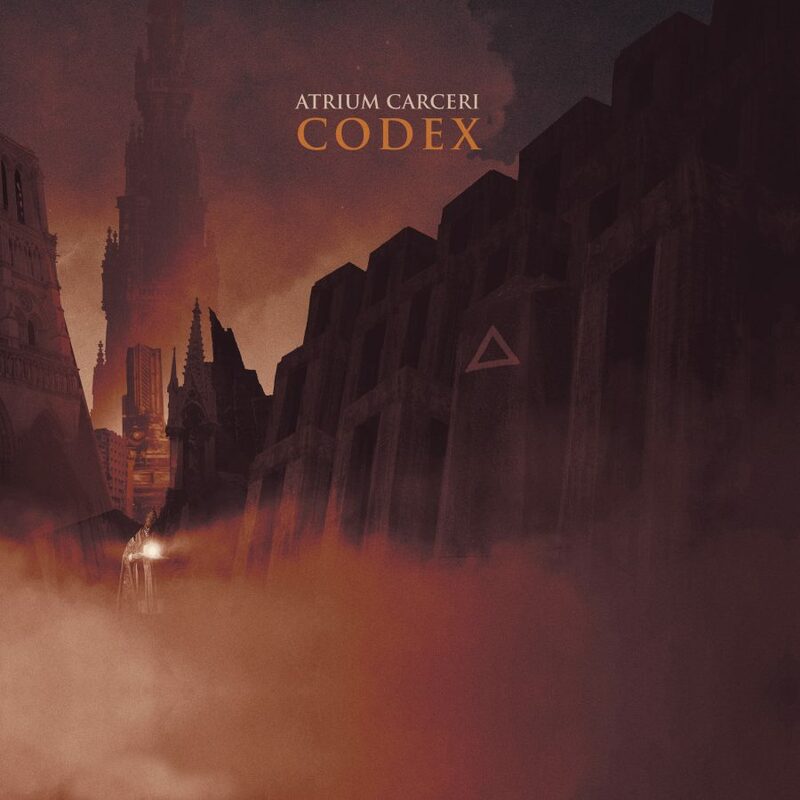 Yet, Codex still managed to surprise, from the opening tracks “The Void” and “From Chasms Reborn”, Atrium Carceri delivers tracks which take on a sort of glitchy off-time feel. This feeling of oddity sets a proper foundation for the rest of the release. Focusing on worlds beyond the veil, either deep in history, or a matter of footsteps away hidden in some dark realm, just beyond the fabric of reality. Almost all the tracks on Codex will show this perfect combination of atmosphere and musicality. Some, like “The Maze” make it central to the track’s foundation, while others such as “Sacrifice to the Machine” use it as a tool for achieving an emotional climax within the story. While the music of some tracks builds the atmosphere, other tracks hold religious connotations, such as “The Empty Chapel” and “The Citadel” which both incorporate treated choral elements. “The Empty Chapel” shows off some of the same elements which elicited such strong emotion on “Österländska Tempel” from his recent collaboration with Herbst9, Ur Djupan Dal (Reviewed here.). A sense of entering some old, decrepit chapel/cathedral, a relic from the height of some civilization’s religious fervor. Codex gives us snippets of many places visited over previous Atrium Carceri albums. On the opening tracks, “The Void” and “From Chasms Reborn”, we seem to be taken to the places and events documented during Void and The Untold. “The Ancient City” takes us once again into that twisted metropolis which we have been able to explore considerably throughout the discography of Atrium Carceri, most notably on tracks like “A Stroll Through the Ancient City” from Kapnobatai or many tracks from Metropolis, including “Decrepit City”, “Industrial District”, “Heart of the Metropolis” and others. We seem to be re-visiting ‘The Warden’ or some similar character on several tracks from Codex. Particularly “Sacrifice to the Machine” and “The Maze” make these connections for me. On “Sacrifice to the Machine” we might actually hear that deep orcish sounding voice which has instilled terror in listeners since the project began. Is this the warden or is this some other entity? Possibly the horrific entity, visually and textually detailed on an earlier track of the album, “The Seer”? As I spent more and more time with Codex, I slowly began to make a realization. There doesn’t necessarily appear to be a whole lot of new revelations presented on Codex. 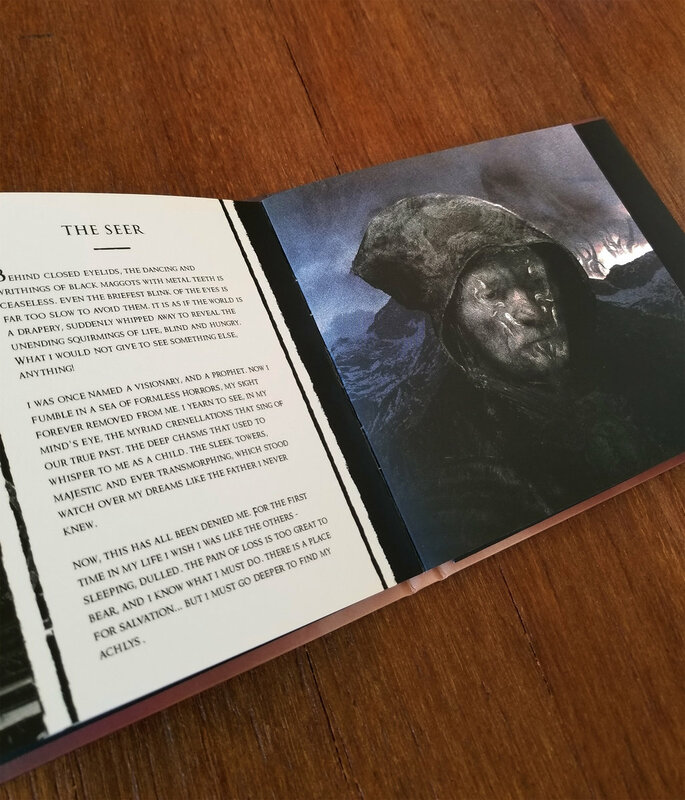 The album seems to be giving us deeper understandings, through atmospheric soundscapes, but also through the focused use of imagery and text within the digibooklet. Within the Atrium Carceri discography there are albums like Cellblock and Void (really most of the discography) which seem to follow very specific story-lines (you can read my in-depth look at Cellblock here), and there are other albums like Archives I-II (read my old review on the Terra Relicta website) which capture fragments of different times and places. 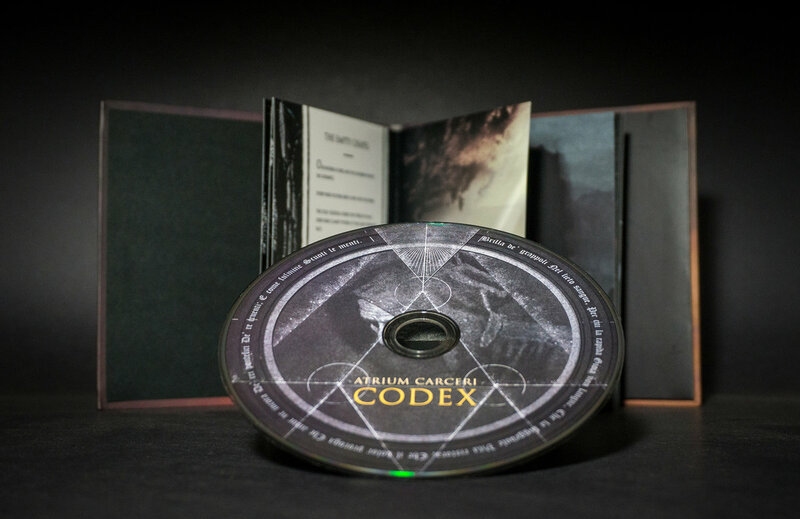 Codex seem to be part of this latter, but in a much more polished fashion, as Archives I-II was a piece-work compilation of old fragments from previous Atrium Carceri album sessions. This is not to say that there is nothing to be learned about the Atrium Carceri story, just that Codex focuses more on clarification of previously explored territory than on creation/unveiling of new territory. Codex gives us added details and we must individually decide how to place these details within the greater context. The many stories within the world of Atrium Carceri give listeners ample reason to keep returning to these albums. In this way, the music of Atrium Carceri is best appreciated in much the same way as the films of David Lynch. One must approach the content from various angles in order to fully understand its meanings and plots. One may listen more casually, focusing on moods and imagined landscapes. Later, one may return to the album, focusing much more specifically on the individual sounds, trying to place them in their proper contexts. One may celebrate the legalization of marijuana in parts of the U.S. with an especially elevated and/or distorted listening session. One may ignore the whole story and focus only on the music, for the sake of enjoying the music. However one approaches Codex, as well as the previous Atrium Carceri releases, the listener seems to have a world of options available. There seems to be a whole universe within the content, one with history, scientific breakthroughs, and psychological/societal meltdowns. The realms of the holy and the apocalyptic are constantly brushing against one another. The question of the self, the ego, and their perceived impact on the political and social order can all be pondered indefinitely. 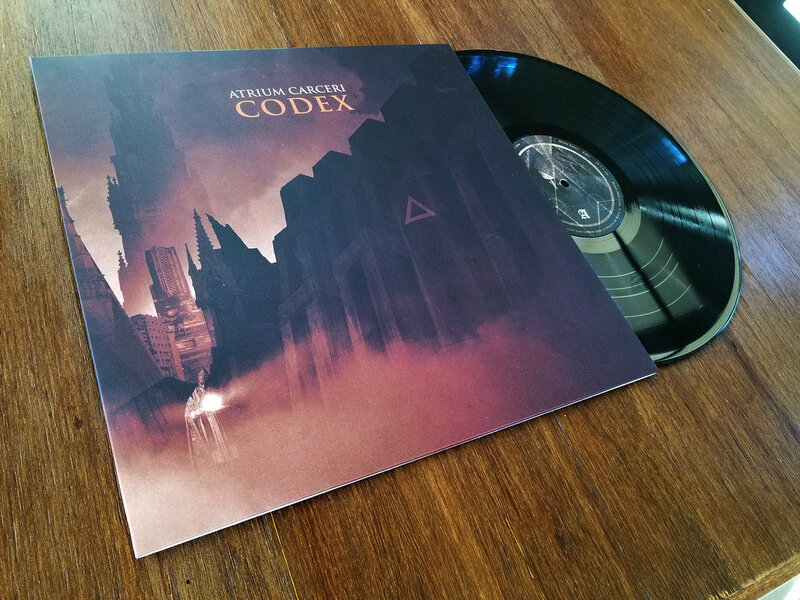 Codex is the first solo Atrium Carceri release to see a vinyl option. For fans of the vinyl renaissance, Codex will be a much anticipated and appreciated release. 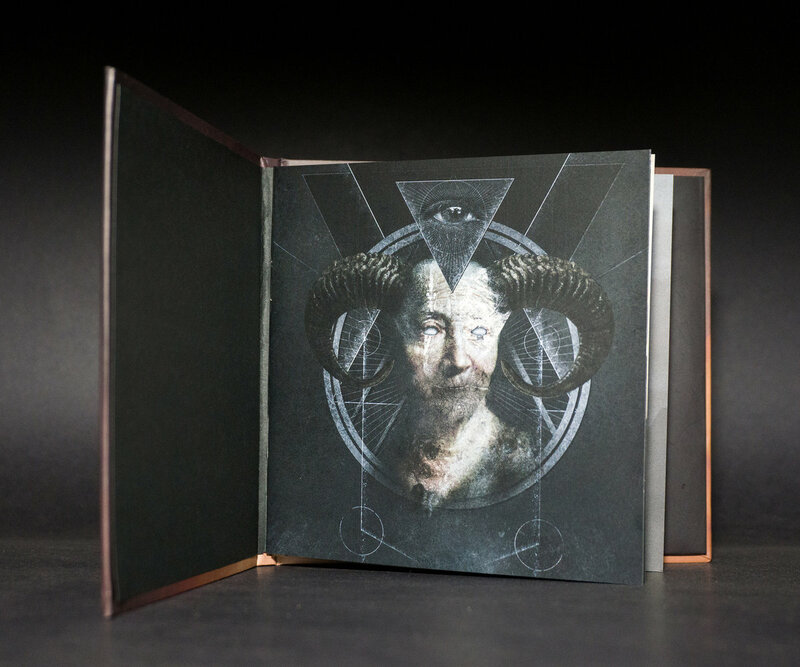 But, for those followers that are keen on fully understanding the intricacies of Atrium Carceri, the digibook CD version is recommended, as it includes a booklet with brilliant artwork and texts which add a much greater sense of depth to the Atrium Carceri story. Then of course there is the digital version, in 24-bit, which will be the go-to for audiophiles looking to find secrets in the vast tapestry of sounds for which Atrium Carceri is most known and revered. Also all artwork is present within the digital version, so the lacking art isn’t a deal-breaker on the vinyl. Codex has not yet uncovered any great burning answers to my questions concerning the realms of Atrium Carceri. But, that doesn’t mean they aren’t present on Codex, still awaiting my revelation. It also doesn’t make the album any less potent of a release from one of the most highly-recognized and well-respected names within the genre of dark ambient. Codex proves once again why Simon Heath has become the standard-bearer for the latest generation of dark ambient happenings. His auxiliary work on Cryo Chamber consistently fills the market with dark ambient albums worth the time and money they require to be fully enjoyed. Meanwhile, his work as Atrium Carceri, but also as Sabled Sun, continues to push the boundaries of what we, the dark ambient community, expect of our musicians. What we expect of a ‘cinematic story’. What we expect of any artist worth their salt. We look to musicians in the dark ambient genre to take us out of our dull everyday lives, and transport us to a place both beautiful and horrifying. There is no artist better at achieving this goal than Simon Heath, Codex shows us, yet again, why this is indisputable. Great album from Atrium Carceri.